Holmes Honda has the lowest prices in the state! All tires are just $10.00 over cost! Cannot be combined with any other offer. Please present at checkout. 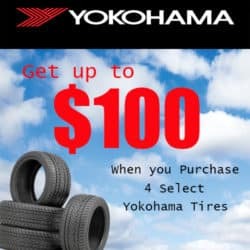 Get $100 Back on Yokohama Tires! When you purchase a set of four (4) select Yokohama tires you may be eligible to receive up to a $100 Yokohama Visa Prepaid Card or Visa Virtual Account. Offer valid on tires purchased at an authorized dealer, and picked up or installed between 12:00 am EDT April 1,2019 and 11:59 pm EDT April 30, 2019. Offer valid on select sizes of American Honda-approved Yokohama tires only.